I don’t know what it is about mysteries, but I’ve always had an appetite for them. Unsettling allusions and stories with chasms, get my imagination running wild. Little did I know that I was heading to a destination that was famously known as the ‘Lighthouse of Horror’ and ‘The tragic Bustard Head lighthouse’. 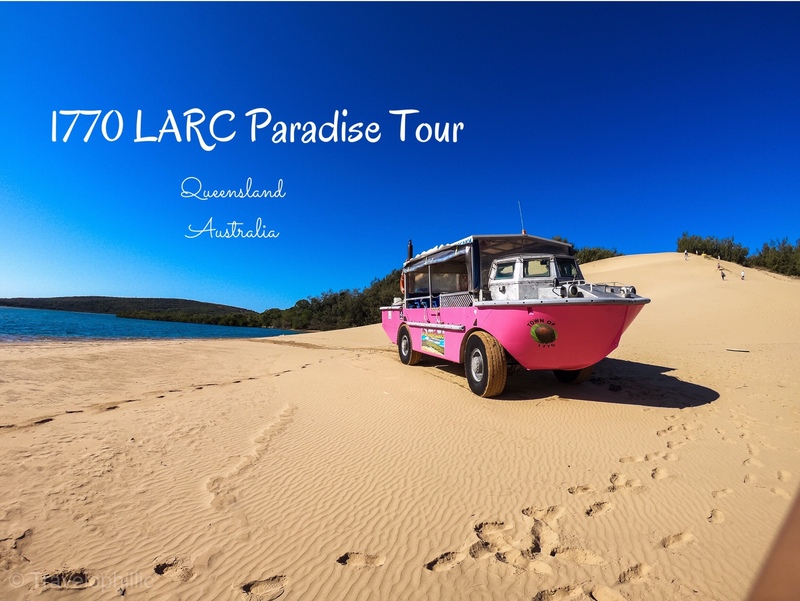 The itinerary of the 1770 LARC Paradise Tour I opted for, included a day-long drive on a unique vehicle from the Vietnam war era- basically a groovy pink ‘ship on wheels’, along the discovery coast, to the Bustard Head lighthouse and back. This is the most convenient mode of transportation to explore the coastal side of Erimbula, with creeks that swell up with pride and high tide. Some days are just as perfect as it can get. With clear sky and good visibility, we hit the jackpot with a pod of playful humpback dolphins! These less studied species are very few in number due to their long calving interval of 4 years. We had 5 of them, swimming alongside our LARC, turning topsy turvy (I would’ve offered a belly rub if not for the distance between us!) and surfacing once in a while as all of us went “wooow” in unison, with Sam (our tour guide, more of a heartthrob!) leading us behind the mic. Troops of Soldier Crabs harmoniously advancing, brilliantly brown Brahminy kites gliding majestically and pied oystercatchers striding in pairs, all brought to mind the marvellous design of nature, the unwritten constitution that one can decipher only through encounter. There’s always so much to learn from the congruity these creatures have probably gathered from their collective subconscious, which we humans couldn’t accomplish despite our enormous forebrains. Or are those prefrontals the culprit, at times I wonder…. The lighter amphibious resupply cargo (LARC) vehicle chugged along the shore without giving a darn about water getting in it’s way. It simply metamorphosed from a 4W drive into a ship as our Skipper, Macka, veered to evade obstacles. An aura of uncanniness had already been built by the numerous stories we heard on our way of strange casualties, that were hard to brush off as coincidence. Now we were about to see this “tragic Bustard Head Lighthouse” and it’s cemetery for ourselves, where most people who moved in as lighthouse-keepers into this isolated island, suffered fatalities (perhaps because of the isolation). Murder, suicide (or was it?! ), drowning, scalding of a one year old, death from unknown causes, and abduction, are all a part of the dark history of this place. The lighthouse guided all the ships passing by this rocky route for a distance of almost 35 Kms (it still does) which was essential back in the day when this was a ‘highway’ on sea. Carpeted by a corduroy road (made of timber) from Jenny Lind Creek up to the lighthouse on Bustard Head, this place unfortunately wasn’t ideal for human habitation, but more of a necessary evil. The history here conspicuously demonstrates the effect of extreme living conditions and distress on the human psyche. We all got a bitter-sweet taste of the local hardship when we stopped for lunch. Everything ranging from food to the toilets had to be brought in here. While we enjoyed a sandwich-billy tea-lamington meal, the sandflies relished a bloodmeal (those who didn’t take the insect repellent spray seriously, were the victim donors). Just like any replete entertainment, there was an upcoming action sequence. It was surprising to find a pristine desert with large sand dunes in the middle of islands, creeks and sea. I hadn’t made up my mind if I wanted to try sandboarding for the first time in my life, but it took me a split second to decide after I heard Sam’s reassuring inspiration. To my surprise not only did I successfully sandboard, but I went for it again! I wasn’t sure which was sweeter, the adrenaline rush sliding down the sand or the feeling of having pulled off that epic feat! There wasn’t a dull moment so far and the day was already coming to an end. It was truly a stunning experience! Beautiful landscapes, LARC ride, history, wildlife, adventure and thrill, I got it all in one day! Carry some water for the journey. Water is served twice along with tea and lunch. There’s no running water at the lunch campsite, hand sanitizers are provided. The toilets are set up for females by them when we get there, which are simple to use. You are provided with sandfly repellent when you get off the LARC, make sure you use it. You need to carry your own sunglasses, caps and towels (if you intend to get into water). If you plan to sandboard, it’s convenient if you wear footwear you can easily take off. It’s recommended you get socks for the hot sand but it wasn’t hot despite being a sunny day in August. We booked a Paradise tour which runs 9am to 4pm on Monday, Wednesday and Saturday costing $160 per adult and $99 per child. I booked it here. Would love to hear your thoughts and experiences in the comments section below! Next A Guide to Paradise Beach Trek, Gokarna.